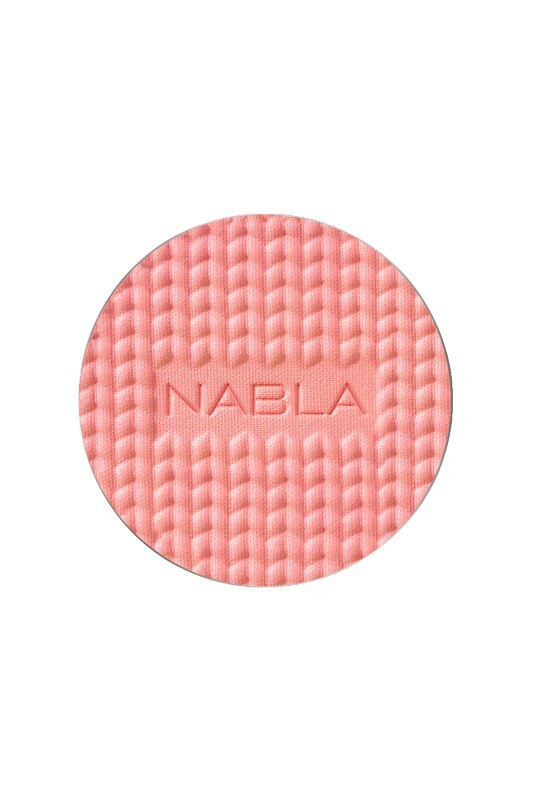 The Nabla Blossom Blush gives you a natural and healthy look that revives your complexion and recreates the effect of a cheek ! You look fresh and naturally flushed into 10 different shades. Intense colour, they are pure selected pigments are blended with an ultra-fine spherical and transparent mica which guarantees extreme ease to blend and great adherence giving a splendid second skin effect with a velvety transparency. 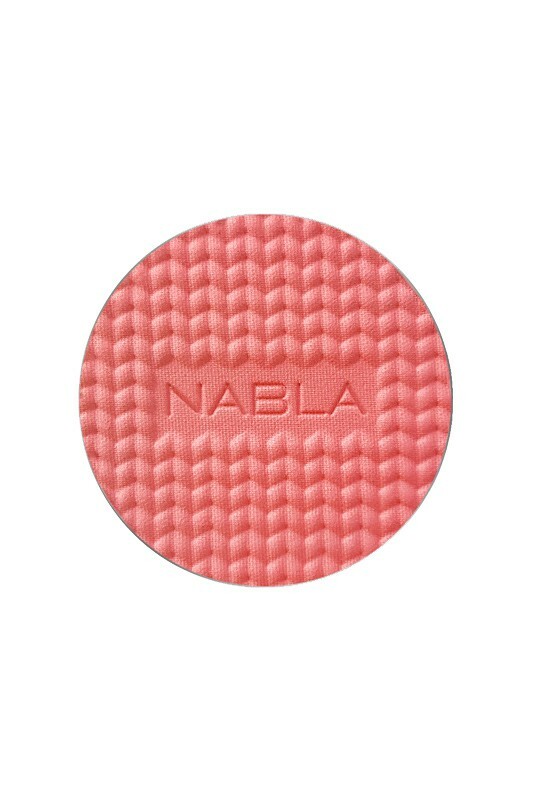 Long-lasting duration, the texture of Nabla Vegan Blushes is soft and smooth. 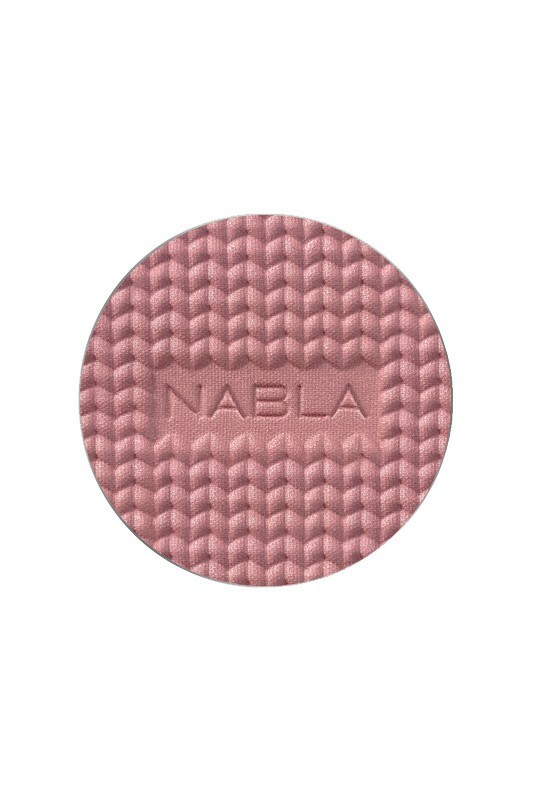 With a simple gesture NABLA’s magnetic refill system allows you to choose between putting the pan into Nabla Magnetic Case Palette or into the rechargeable compact, changing the product once it is finished or switching shades to carry in your bag… even just for a night out ! Delicately scented with Vanilla and Lime. 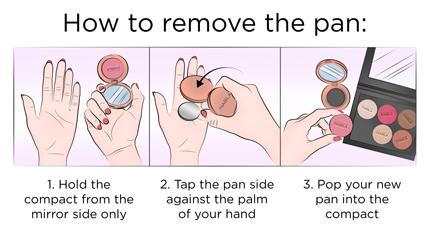 Free from silicone, mineral oil, parabens, pegs, phtalates, edta. Formulated to minimize allergy risks. 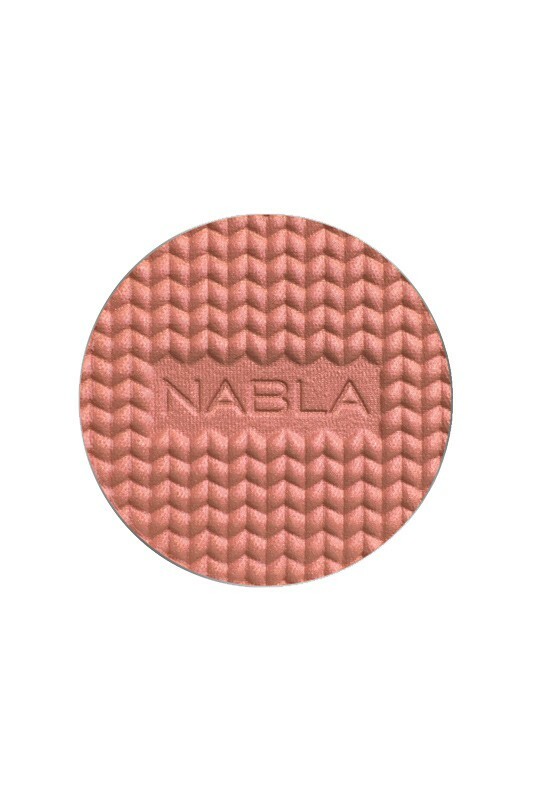 Sleek mirrored compact : 3.5 g / 0.12 oz. NABLA Blushes sublime naturally your cheeks ! Nabla's Vegan Blossom Blush are refillable ! All the NABLA Blushes "Blossom Blush" are 100% vegan ! Ingredients of Beloved : talc, mica, squalane, zinc stearate, diisopropyl sebacate, capryloyl glycine, undecylenoyl glycine, tocopherol, silica, cocos nucifera (coconut) oil, hibiscus sabdariffa flower extract, gardenia tahitensis flower, tin oxide, alumina, limonene, linalool, parfum (fragrance). +/− (may contain): ci 77891 (titanium dioxide), ci 77491 - ci 77492 - ci 77499 (iron oxides), ci 77742 (manganese violet), ci 77007 (ultramarines), ci 16035 (red n.40 lake), ci 15850 (red 7 lake, red 6), ci 19140 (yellow 5 lake). 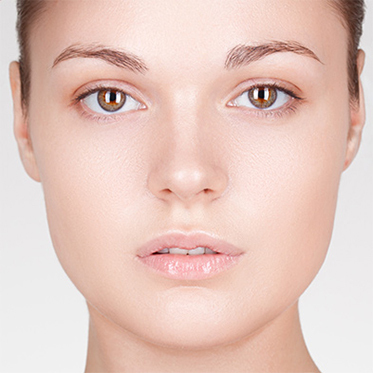 Ingredients of Coralia : talc, mica, squalane, zinc stearate, diisopropyl sebacate, capryloyl glycine, undecylenoyl glycine, tocopherol, silica, cocos nucifera (coconut) oil, hibiscus sabdariffa flower extract, gardenia tahitensis flower, tin oxide, alumina, limonene, linalool, parfum (fragrance). +/− (may contain): ci 77891 (titanium dioxide), ci 77491 - ci 77492 - ci 77499 (iron oxides), ci 77742 (manganese violet), ci 77007 (ultramarines), ci 16035 (red n.40 lake), ci 15850 (red 7 lake, red 6), ci 19140 (yellow 5 lake). Ingredients of Daisy : talc, mica, squalane, zinc stearate, diisopropyl sebacate, capryloyl glycine, undecylenoyl glycine, tocopherol, silica, cocos nucifera (coconut) oil, hibiscus sabdariffa flower extract, gardenia tahitensis flower, tin oxide, alumina, limonene, linalool, parfum (fragrance). +/− (may contain): ci 77891 (titanium dioxide), ci 77491 - ci 77492 - ci 77499 (iron oxides), ci 77742 (manganese violet), ci 77007 (ultramarines), ci 16035 (red n.40 lake), ci 15850 (red 7 lake, red 6), ci 19140 (yellow 5 lake). Ingredients of Harper : talc, mica, squalane, zinc stearate, diisopropyl sebacate, capryloyl glycine, undecylenoyl glycine, tocopherol, silica, cocos nucifera (coconut) oil, hibiscus sabdariffa flower extract, gardenia tahitensis flower, tin oxide, alumina, limonene, linalool, parfum (fragrance). +/− (may contain): ci 77891 (titanium dioxide), ci 77491 - ci 77492 - ci 77499 (iron oxides), ci 77742 (manganese violet), ci 77007 (ultramarines), ci 16035 (red n.40 lake), ci 15850 (red 7 lake, red 6), ci 19140 (yellow 5 lake). Ingredients of Hey Honey ! : talc, mica, squalane, zinc stearate, diisopropyl sebacate, capryloyl glycine, undecylenoyl glycine, tocopherol, silica, cocos nucifera (coconut) oil, hibiscus sabdariffa flower extract, gardenia tahitensis flower, tin oxide, alumina, limonene, linalool, parfum (fragrance). +/− (may contain): ci 77891 (titanium dioxide), ci 77491 - ci 77492 - ci 77499 (iron oxides), ci 77742 (manganese violet), ci 77007 (ultramarines), ci 16035 (red n.40 lake), ci 15850 (red 7 lake, red 6), ci 19140 (yellow 5 lake). Ingredients of Impulse : talc, mica, squalane, zinc stearate, diisopropyl sebacate, capryloyl glycine, undecylenoyl glycine, tocopherol, silica, cocos nucifera (coconut) oil, hibiscus sabdariffa flower extract, gardenia tahitensis flower, tin oxide, alumina, limonene, linalool, parfum (fragrance). +/− (may contain): ci 77891 (titanium dioxide), ci 77491 - ci 77492 - ci 77499 (iron oxides), ci 77742 (manganese violet), ci 77007 (ultramarines), ci 16035 (red n.40 lake), ci 15850 (red 7 lake, red 6), ci 19140 (yellow 5 lake). Ingredients of Satellite of Love : talc, mica, squalane, zinc stearate, diisopropyl sebacate, capryloyl glycine, undecylenoyl glycine, tocopherol, silica, cocos nucifera (coconut) oil, hibiscus sabdariffa flower extract, gardenia tahitensis flower, tin oxide, alumina, limonene, linalool, parfum (fragrance). +/− (may contain): ci 77891 (titanium dioxide), ci 77491 - ci 77492 - ci 77499 (iron oxides), ci 77742 (manganese violet), ci 77007 (ultramarines), ci 16035 (red n.40 lake), ci 15850 (red 7 lake, red 6), ci 19140 (yellow 5 lake). Ingredients of Regal Mauve : talc, mica, squalane, zinc stearate, diisopropyl sebacate, capryloyl glycine, undecylenoyl glycine, tocopherol, silica, cocos nucifera (coconut) oil, hibiscus sabdariffa flower extract, gardenia tahitensis flower, tin oxide, alumina, limonene, linalool, parfum (fragrance). +/− (may contain): ci 77891 (titanium dioxide), ci 77491 - ci 77492 - ci 77499 (iron oxides), ci 77742 (manganese violet), ci 77007 (ultramarines), ci 16035 (red n.40 lake), ci 15850 (red 7 lake, red 6), ci 19140 (yellow 5 lake). Ingredients of Nectarine : talc, mica, squalane, zinc stearate, diisopropyl sebacate, capryloyl glycine, undecylenoyl glycine, tocopherol, silica, cocos nucifera (coconut) oil, hibiscus sabdariffa flower extract, gardenia tahitensis flower, tin oxide, alumina, limonene, linalool, parfum (fragrance). +/− (may contain): ci 77891 (titanium dioxide), ci 77491 - ci 77492 - ci 77499 (iron oxides), ci 77742 (manganese violet), ci 77007 (ultramarines), ci 16035 (red n.40 lake), ci 15850 (red 7 lake, red 6), ci 19140 (yellow 5 lake). Ingredients of Kendra : talc, mica, squalane, zinc stearate, diisopropyl sebacate, capryloyl glycine, undecylenoyl glycine, tocopherol, silica, cocos nucifera (coconut) oil, hibiscus sabdariffa flower extract, gardenia tahitensis flower, tin oxide, alumina, limonene, linalool, parfum (fragrance). +/− (may contain): ci 77891 (titanium dioxide), ci 77491 - ci 77492 - ci 77499 (iron oxides), ci 77742 (manganese violet), ci 77007 (ultramarines), ci 16035 (red n.40 lake), ci 15850 (red 7 lake, red 6), ci 19140 (yellow 5 lake). Ingredients of Happytude : talc, mica, squalane, zinc stearate, diisopropyl sebacate, capryloyl glycine, undecylenoyl glycine, tocopherol, silica, cocos nucifera (coconut) oil, hibiscus sabdariffa flower extract, gardenia tahitensis flower, tin oxide, alumina, limonene, linalool, parfum (fragrance). +/− (may contain): ci 77891, ci 77491, ci 77492, ci 77499, ci 77742, ci 77007, ci 16035, ci 15850, ci 19140, ci 45410. Ingredients of Habana : talc, mica, squalane, zinc stearate, diisopropyl sebacate, capryloyl glycine, undecylenoyl glycine, tocopherol, silica, cocos nucifera (coconut) oil, hibiscus sabdariffa flower extract, gardenia tahitensis flower, tin oxide, alumina, limonene, linalool, parfum (fragrance). +/− (may contain): ci 77891, ci 77491, ci 77492, ci 77499, ci 77742, ci 77007, ci 16035, ci 15850, ci 19140, ci 45410.